Join us for a public cruise in and around the San Francisco Bay. We operate regular public boat charters so that you can find the best experience to fit within your ideal schedule. From whale watching to Alcatraz, we have many public cruises that are sure to meet your travel and tourism needs. Check our calendar at the top of this page, or take a look at some of our featured trips below - you'll find many famous (and some not quite as famous) cities and landmarks throughout the San Francisco Bay. Once you find the event you'd like to attend, simply click on the "Book Now" button and follow the instructions. All of our public cruises depart from our dock located in downtown Tiburon, you can find detailed information about directions on our Contact page. Please feel free to call us at 415-789-6082 or contact us by email for more information. This spring we have seen exceptional whale activity in San Francisco Bay and around the Golden Gate Bridge. Join us aboard the Tamalpais as we journey the Bay and just outside out the Golden Gate in search of these majestic marine mammals! The cruise is 2 hours long departing from Tiburon at 2:30 pm returning at 4:30 pm every Saturday starting June 16 through September 22, 2019. Adults (13+) are $60, Children (6-12) are $30 and Small children (0-5) are free. Sunset cruises operate each Friday and Saturday night starting May 18, 2019, through October 13, 2019. Cruises depart Tiburon at 6:30 pm and return at 8:00 pm. Visit Angel Island Tiburon Ferry! The Angel Island is our largest vessel, able to accommodate 400 passengers. 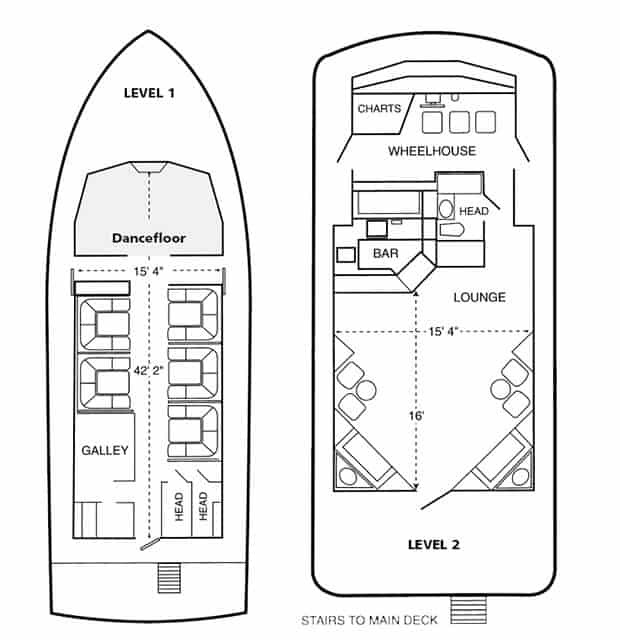 Because of her open-air second deck, she is great for sunset cruises and other outdoor events. In addition, she can handle large parties and events, as well as transportation for a large number of people at once. The Bonita is our small, rustic water taxi. Great for transporting people quickly, she offers a single deck with a roof along her full length and clear protective windows for the front half of the seating. She is great for water taxi services and short tours of Angel Island or Sausalito. The Tamalpais is our fastest and most luxurious vessel. She is great for parties, weddings, receptions, funerals, bar mitzvahs, quick transportation across the Bay, and just about any other event you can think of.